Senator Durbin Speaks Up in Support of Press Freedom!!! Members of the Online Gambian Media Community which just Happens to be the only truly Independent Media in the Country have been pleased by the Comments by Senator Richard Durbin Democrat from Illinois. What did the Senator say that created such a fervor in this Community? The Senator Addressed the State of Freedom of the Press in the small West African Country of Gambia. Although it has not Generated the Interest here in the United States like the situations in Northern Uganda, Darfur and Zimbabwe the Situation in Gambia is a reason for concern. In a region where concern is rising over the increase in drug-trafficking the situation which the Senator made these remarks on the Floor of the United States Senate has been known for a year. The Senator was raising the Plight of Chief Ebrima Manneh. 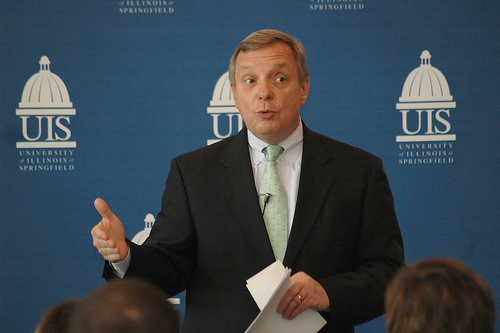 Senator Durbin raised the Plight of an Imprisoned Journalist in the Gambia on the Floor of the United States Senate. Chief Ebrima Manneh was a Journalist with the Daily Observer. He was taken into Custody by two Agents of the NIA (National Intelligence Agency) in July of 2006. Although He has not been Officially Charged with a Crime it is believed that he was taken into Custody for attempting to publish a BBC Report that was critical of President Jammeh. There have been Persistent Reports by Gambian Journalists that he is in Government Custody. The Gambian Government has Denied having him in custody. The Community Court of Justice of the Economic Community of West African States has deemed that his arrest Illegal and has ordered that he be released. Senator Durbin has attempted to contact the Gambian Embassy in Washington but has not recieved a Reply. Amnesty International has Adopted him as a Prisoner of Conscience. The Editor of Confused Eagle Commends Senator Durbin for his Efforts in this Matter and also calls for the Release of Mr. Jammeh! !